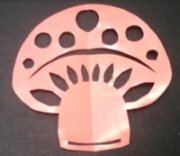 Symmetrical paper cutting is one of the easiest cuttings, great paper cutting practice for younger kids. After your kids try it, you can encourage them to make their own paper cuttings. 1. The picture below shows you how to fold the paper. Remember always fold the colored side of the paper inside, if your paper is colored on one side. You will draw the pattern on the white side. they are free to download. Find the pattern that you would like to cut, print the pattern as much as you like, they are free to download. 2. 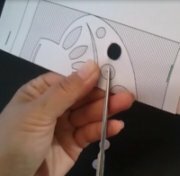 After you print the pattern, you can draw the pattern onto your paper, or you can also staple the pattern on the top of your paper. Follow the line and dashed line to cut out the pattern. 4. Staple the pattern and folded paper together on the parts that you will cut and remove, so the pattern will not move away when you cut it. 5. Use the point of your scissors and gently make a hole into the section you need to cut out. Then insert your scissors and cut out the hatched part(s). * Always cut out the inside parts first, this will help keep your pattern stay where it is. 7. 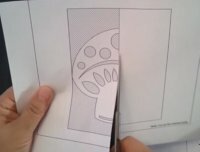 Now you just made a beautiful paper cutting.